Presenting products has never been easier. Display product on module positions. Create entries such as "Save €3.99 now!" 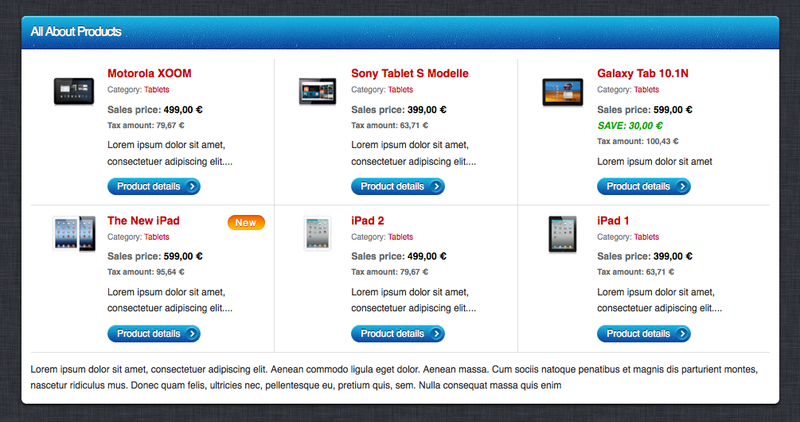 This VirtueMart module allows you to present your products in a module of your template. If you want you can limit the display to show only the products of a certain category. You can also define the maximum number of products and the number of products to be shown per row. Our module offers you the possibility to create a header and a footer which will appear on top of and underneath the product listing, and a text in case there are no products to be shown. The latter case may occur if you want to show the products that have been selected last and the visitor has only just entered your website. Moreover, you can hide or show each item (e.g. product name, product image, product prices, short description). For the short description, you can also enter the number of characters after which the text is to be truncated. It will always be truncated after the end of a word. For the button linked to the product, you can set a custom text which will appear instead of the default text derived from the VirtueMart language file. You can even individually set whether or not you want to hide the horizontal and vertical separators. We would like to put special emphasis on the display of product prices. 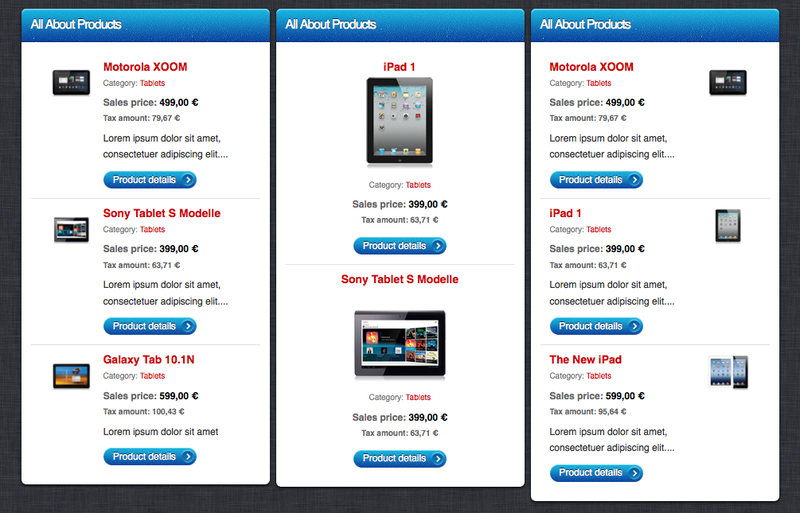 You can hide or show each price display such as sales prices, included taxes etc. independent of the settings in the VirtueMart configuration. You can also hide the display of the text in front of the price, store a custom text and define whether the text is to appear in front of or behind the price. Thus, you can create entries such as "Save €3.99 now!" or "€3.99 price savings!". You can also store custom information such as "plus s&h: €3.99" which will appear underneath all prices. However, the best thing is that you can define the order of the individual prices. Thus, it is possible to show the sales prices after the tax amount or vice versa. It is up to you to determine the order of all prices. In addition, you can also define the number of decimal places for rounding. To put more emphasis on special products, you can define badges for certain products. Thus, you can, for example, show the text "on sale" to highlight a discount. Generally, the module is delivered with three different layouts that are shown on our demo site.